I haven’t been setting an alarm this leg as a promise to myself. I woke up on my own at 5:50am and could tell that I had gotten over the crappy exhaustion I go through a few days every month. I was ready to hike! I knew it was a bit early for Cherry Picker, so I waited til 6am to wake him and we were hiking by 6:50am. As we were getting ready, I remarked that it smelled like fire, but we were in the woods and couldn’t see anything. 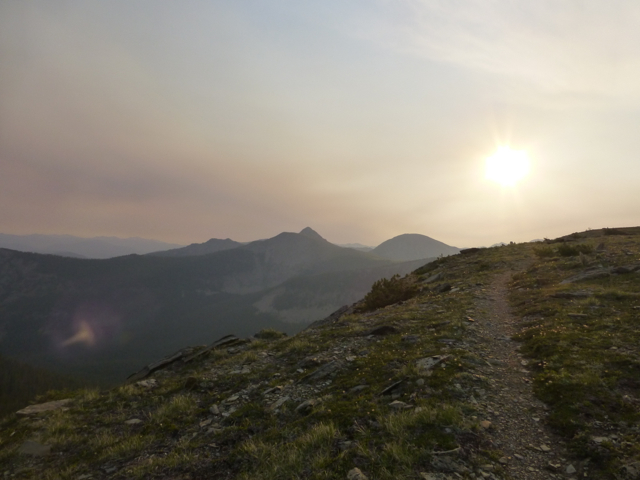 We had an immediate climb over a pass and as we hiked up, it became more evident that there was a fire, and that it was just on the other side of the Divide from us. It was hazy and smelled strongly. Again, it made for a cool sunrise. When we got to the top, we could see smoke rising into the sky faintly. It was worrisome, but we were thankfully hiking away from it. When we got to the top of the second (and final!) pass of the morning, I tried to get a picture. Cherry Picker and I hiked a couple hours together this morning and listened to the rest of the audiobook The Land of Oz. It was okay for a freebie from the library and kept us distracted from the climbs. Then Cherry Picker and I parted ways. He is taking an alternate route that about half the hikers take that is called the Anaconda Cutoff. The route I’m taking is considered the “official route” and is about three days longer. Both seem to have a considerable amount of road walking. Everyone has their reasons for which route they take. Some main reasons for NOBOs is that they are tired and just want to finish, they may be on a schedule that requires that they finish earlier, or maybe they are hiking late in the season and need to get to the finish in Glacier before snow comes. 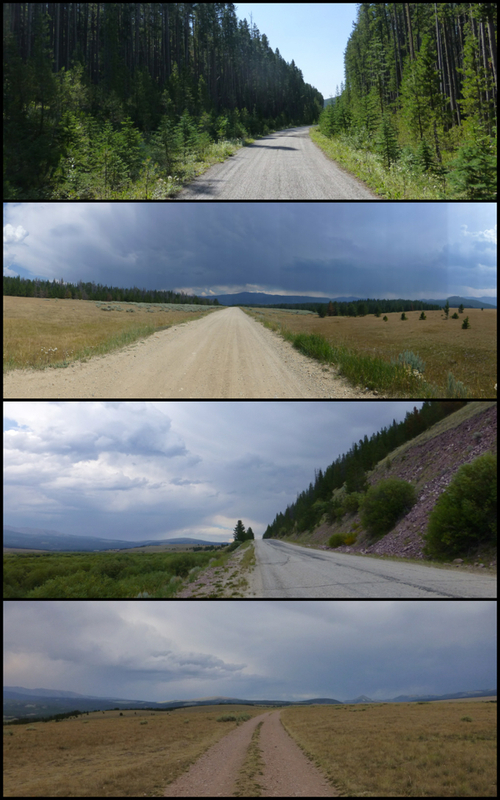 I have no strong reason not to do the official trail, so I’m doing the longer Butte route. One positive of this is that possibly some of the hikers behind me will choose the Anaconda Route and then I’ll have more hikers around me toward the end. It will be interesting to see as the routes seem to reconnect a day out of my upcoming town of Butte where I will also be taking a zero(yay!). So, back to today’s hiking. 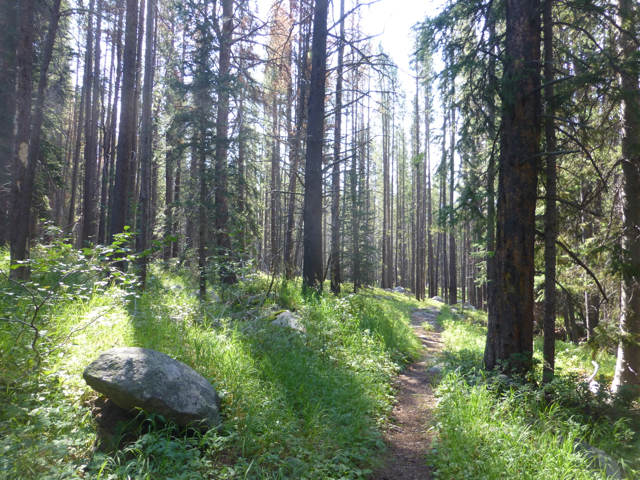 The Butte Route started out nice with maintained trail that took meandering switchbacks down as I descended over 3,000ft. I left the Anaconda-Pintler Wilderness and started my day of road walking. The trail is on the right in the first picture and I ended up in the valley to the left of the lake, which is Upper Seymour Lake. Fortunately, much of the trail and road today had a gentle down grade and good terrain, so I was able to jog on and off throughout the day. In the afternoon, I listened to some of the remaining audiobook options I have. My plan is to download more in Butte as I’ve gone through them much faster than I anticipated. I had a blog follower, David, send me some audio of some 1950s radio shows and I listened to some of them. One series was a futuristic sci-fi kind of show called X Minus One and the other is a series called Bold Ventures that features Catherine Hepburn and Humphrey Bogart. Both series are not something I’d pick on my own, but it was nice to have something different and unique to listen to while on a long boring road. I tried to imagine what it must have been like when these were real weekly shows. I wondered if my grandparents listened to any of them. I also kept myself occupied by multitasking and doing my blog as I walked. That saved me from having to do it in my tent. I also did some calculations. There are multiple roads to hitch into Butte. The first one comes tomorrow and the next one is about 27mi after it. With the pace I’m doing and the extra food I have, I may just keep hiking tomorrow and do one more day to shorten the next leg. I’ll make that decision tomorrow. 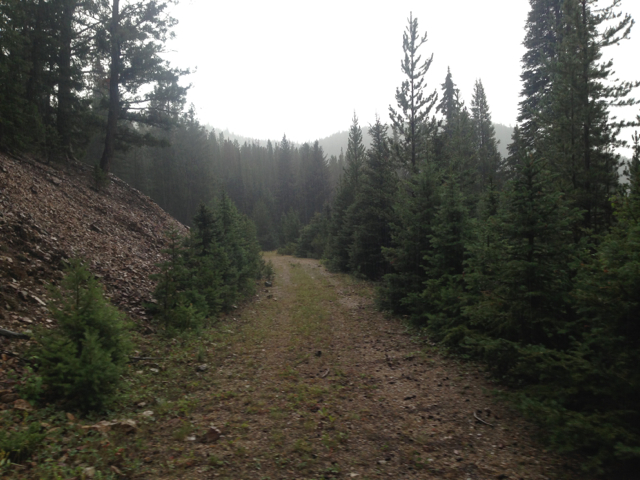 As for today, I also kept my mind focused on the trail at times as there were many turns on to various roads. I was very happy to have the GPS, as most roads were not labeled or marked in any way, and I only saw one CDT marker and no other indication that I was on a trail for most of the day. As afternoon came, the ominous clouds gathered as they have the previous three days. I was hoping to dodge the afternoon thunderstorms now that I’m out of the higher elevation and I was fortunate…until 5pm when the rain came down hard. I found shelter in the trees and got my rain gear on. It stopped ten minutes later and then started up again 20mins after that. The last hour and a half of the day, I walked in a steady cold rain. That’s he longest I’ve walked in rain all trip. Here is what it looked like the last couple miles of the day and where I camped. I needed to get to my water source to camp, and when I got there at 7pm, the rain finally stopped. I was not happy to be somewhat wet, but I was very thankful that it stopped so I could do all my camp chores while drying things out. My backpack and rain jacket are still wet, but will hopefully get a chance to dry in the morning. I am camped where I can hear the stream in the distance and that helps me sleep. I’ve noticed moose droppings around now that my tent is up and I’m hoping not to have any curious visitors in the middle of the night. If this rain continues, who knows, I might just take the first available road into town tomorrow afternoon!